As many of you know, Metro is working on an update to its long-range transportation plan (LRTP). The LRTP is the “road map” that determines how Metro will spend its money on transportation projects and programs in the coming decades. While working with local cities and stakeholders to update the project list, Metro is considering a potential ballot measure to raise money for projects in the new LRTP. As part of that effort, Metro is seeking passage of a state bill — known as SB 767 — that would give Metro the legal authority in a future election to ask voters to consider a sales tax increase. The good news for Metro: the bill was recently approved in the state Assembly and Senate. The bill is now on the desk of Governor Jerry Brown, who can either sign the bill, allow it to become law without his signature or veto it. It’s important to note that the Metro Board of Directors has not yet decided on a long-range plan, nor has the Board decided what, if any, sales tax increase it would ask voters to approve. The state bill allows for an increase up to a half-cent. A decision about the potential ballot measure is expected to be made by the Board next year in the late spring or early summer. As more details emerge in the coming months, I’ll do my best to make sure all the information you need is provided here. For those interested in this process, the following sample letter from Metro can be used to express support to the Governor for SB 767. Letters can be sent by email to leg.unit@gov.ca.gov or faxed to (916) 558-3177, preferably by this Friday. Likewise, if you are against this for whatever reason (don’t like the idea of more new taxes when Metro isn’t doing other ways to come up with funding on their own or it’s only targeting specific projects that do not benefit your area), you can also write, fax or send an e-mail to Gov. Brown with your reasons why he should veto SB 767. And also remember that this is just a bill to allow a ballot measure to be brought up next year. If and when Metro decides to put another sales tax toward us and if you for some reason do not like the idea, you are free to vote “No” on this as well. Central issue for me and Measure R-2 is the Highway Program ans the projects to add >350 lane miles of new pavement to the freeway system…Hi.Desert Corridor-60mi x 4+lanes, 710 South 24mi x 2-4lanes, and 710 North 6mi x 8 = 240+72+48 = 360lane-mi.with $$ wide ranging estimates up to $40B = $10B+$20B+$10B with trivial amounts supported initially by Measures R & R-2…These projects have created considerable opposition which killed Measure J and can act to derail the entire transit funding for at least two more years….Including massive expensive highway project will kill the good transit project to serve all of the LACo. residents. Any bill authored by Kevin “Ghost Gun” de Leon gets a no vote from me. The FBI has done several inquiries to his practices and shady areas involving voter fraud to bribes, but he managed to skirt them. I just don’t trust this guy. If you ask me, this guy should’ve been kicked out of office along with Calderon, Yee, and Wright. I’ve e-mailed Governor Brown and urged him to Veto the measure unless it’s amended to correct an action the governor took while previously in office killing the Glendale Freeway extension. I urge everyone to join me in opposing this tax increase. The last thing we need is another light rail line going no where and failure to mitigate an action that has caused grid lock on the Westside. There is no ballot measure yet. I would urge all voters to wait and see what, if any, ballot measure goes forward before deciding to vote ‘yes’ or ‘no’ on it. If SB 767 gets signed by Gov. Brown, Metro has the authority to ask for a ballot measure at ANYTIME, not just 2016. Basically it’s granting the authority for Metro to keep begging taxpayers for money whenever they feel like it without them making fiscally responsible actions. Metro may or may not do it 2016, nothing says Metro can do it in 2017 or 2018 either. The only way to stop Metro from gaining the ability to do this is to urge Brown to veto SB 767. The tax payers MAY vote for the sales tax increase this time. However, if Metro is planning to raise the sales tax regularly, at some point the tax payers will say no. 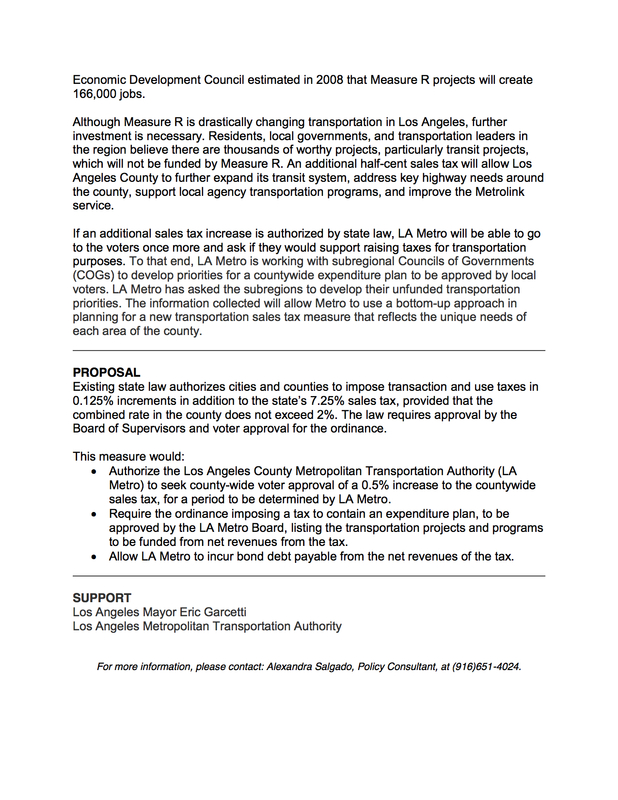 Frankly, I do not want to have the highest sales tax in LA County; like the price of gasoline. We already pay the highest gas tax in the nation, we already have high vehicle registration fees, smog check fees, special CA only gas blends, CA only carburetors, sales taxes upon sales taxes, a fee for this a fee for that, and billions of dollars of lotto sales going to our schools. Yet our roads are in bad shape, sidewalks are uprooted, potholes are everywhere, and our schools rank 49th in the nation. You have to start wondering where our tax dollars are really going to. Sent an e-mail to Gov. Brown to veto this bill. Why should I support Metro with more taxes when they can’t get a simple thing like online balance transfers resolved? It’s almost have been a month since the new website went live and there are no updates at all to this matter. The matter is so simple that it can take less than five seconds to do this online. Metro forces me to keep calling the 866-827-8646 number with looooooooooooooooooong wait times with annoooooooooooying voice prompts on auto-loop telling me stuff I already know. “did you know that you can do most of your stuff online at taptogo.net?” Except for balance transfers, that’s why I’m calling!!!! If Metro got this issue resolved, maybe, just maybe I would’ve voted for it. Instead all I see is Metro incompetence that a simple fix like this can’t be done despite billions of taxpayer money Metro is given. That reminds me of trying to add money on to my tap card on line and it never shows up on the card. I called customer service and got no where. 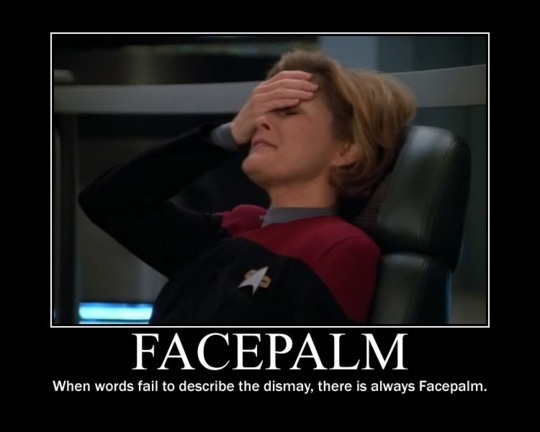 I went to customer service at their headquarters and they have incompetent people working there. I agree with what you stated above. I finally got the matter settled but it took me four months to get to the right people. How much time did you spend to get how much money credited? How many hours of Metro staff/contractors did that take? If either of those totalled to too high a figure, then you caused a net loss of money. Yes, it’s the taxpayers’ fault, not the inept government agency. Government is always right and the public should just deal with it. Ill take high taxes to save time in a commute. Life in general is Time vs Money; no other way to skin it. Save me time while I go make my money, freeing up time for me to either make more money or rest for when it is time to go make more money. More money I make, the better I am paying taxe increases (that I see a return on). It must be voted on first or course, and feasible. If time is the moat important factor, then the fastest way to get around LA is with a motorcycle. Then, you won’t need more taxes to let gov’t help you, which in most cases, gov’t does not. This bill will almost certainly pass the state legislature. The more interesting question is what Metro’s priorities will be when it comes to the next request for a tax measure. I think getting rid of the 30 year sunset on Measure R would be a promising approach. The money could be used to build more rail lines in the more distant future and eventually be re-oriented towards maintenance of our existing infrastructure. 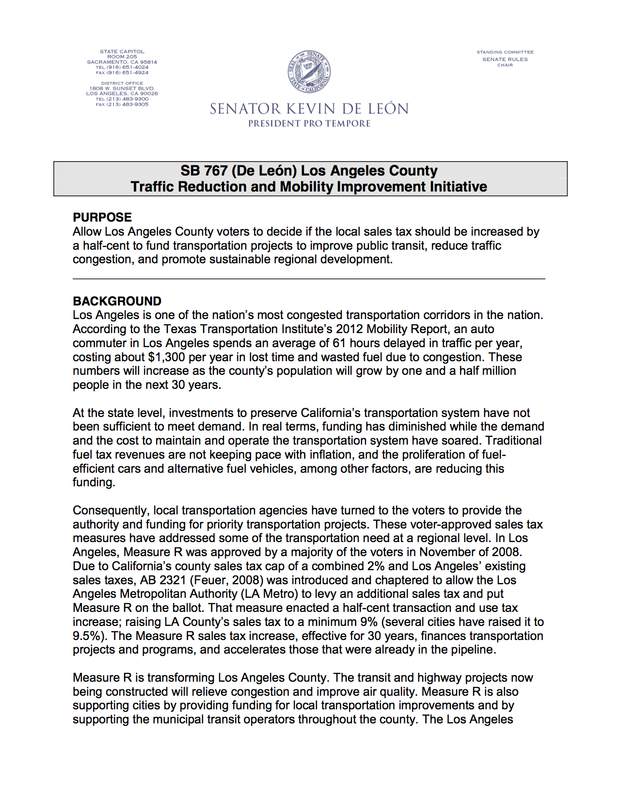 Without the policy piece from local government partners, I fear all the money in the world can only go so far in reorienting LA County’s transportation patterns in a more sustainable direction.